Irish eyes were smiling again at the home of golf as John Ross Galbraith took up where Conor O’Rourke left off last year in the St Andrews Links Trophy. On a day when O’Rourke started his title defence with a 72, Galbraith took route 66 on the Jubilee Course to set the pace. His six-under-par opening salvo secured a one-shot lead over rising Scottish star Jamie Stewart and two overseas challengers, Australian David Micheluzzi and Germany’s Claudio Consul. “I played lovely golf all day but didn’t putt too well on the first nine,” said Galbraith, a 23-year-old from Belfast after bouncing back from a bogey-bogey start to card eight birdies, including four in a row. “On the sixth, I had an eagle putt but we had to wait for a minute or two for the torrential rain to go off a bit and I two-putted. 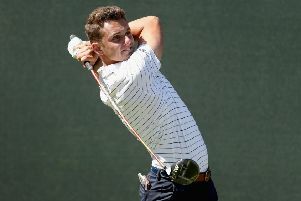 Teenager Stewart, who has been in good form recently, signed for six birdies as he came in late in the day with his 67. Melbourne man Micheluzzi bagged five birdies on the spin as he also got off to a promising start while Consul’s card was illuminated by an eagle-3 at the 12th. “I only had nine putts in the first nine holes, pitching in at the second and eighth,” reported Micheluzzi, who was backed up by compatriot Zach Murray as he carded a 69. That was matched by Craig Howie as the Peebles player joined Stewart in getting off to a good start among the home contingent. “It wasn’t easy out there, but we got the best of the day,” said Howie, winner of the Craigmillar Park Open earlier in the year. Howie’s fellow Great Britain & Ireland squad member, Irishman Robin Dawson, also opened with that score, as did recent Brabazon Trophy winner Kyle McLatchie from South Africa. Newly-crowned Scottish Stroke-Play champion Liam Johnston opened with a 71, as did three other home players - Robert McIntyre (Glencruitten), Connor Syme (Drumoig) and Callum Fyfe (Cawder). “My game is as good as it ever has been since I changed coaches,” said Scottish No 1 MacIntyre after his effort. Syme, who won the Battle Trophy a few miles along the coast at Crail earlier in the year, was also “pleased” with his day’s work.